People looking for the cost-effective and long-term advertisement medium, then our wall painting on Gujarat highways can prove to be the best bet for their requirement. 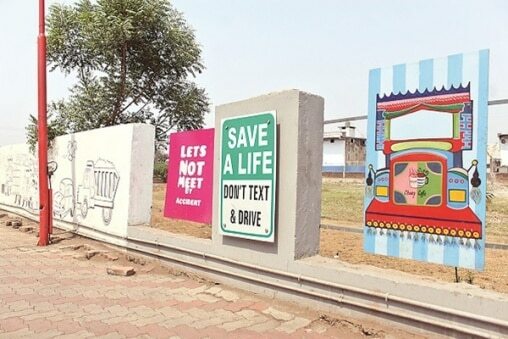 We are top notch outdoor advertising company in Ahmedabad, providing wall painting service across Gujarat highways that has gained the popularity for its highest impact and budget-friendly quotients. We have well-versed painters and locations whose combination can result in the eyeball advertisement for every passing consumer from the highways. On availing our wall painting on Gujarat highway service, we provide a prime location that has a high frequency of relevant audience and best in class quality wall paintings having the potential to convey the product/ service to every passerby with an ease. The use of the premium quality colors ensures bright color display that lasts for longer lifespan without fading. If your budget is low and looking for the long duration ads, then nothing can deliver you better than wall painting on Gujarat highways.